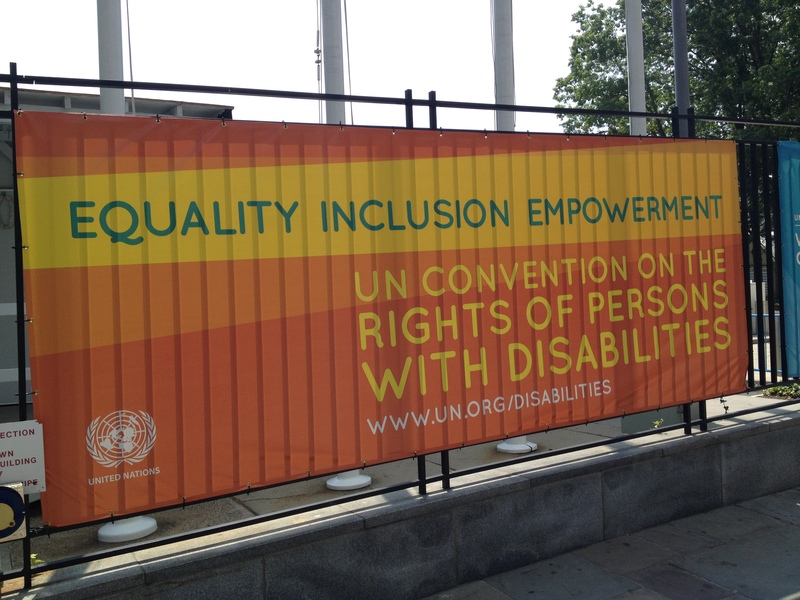 Last week, representatives from more than 150 countries met in the UN Headquarters in New York City to commence the Sixth Conference of State Parties (COSP) to the UN Convention on the Rights of Persons with Disabilities (CRPD). In accordance with Article 40 of the Convention, annual meetings, the COSP, are held to discuss the implementation of the CRPD since it’s coming into force in 2008. The CRPD marks a major shift in the understanding and perception of disability: persons with disabilities are no longer “objects” of charity or medical treatment, but “subjects” with rights, who are capable of claiming these, making decisions on their own and being active members of society (cf. UN Enable 2012). Limitations created by disability are therefore no “problem” of the person but rather a problem of barriers created by society. CRPD`s fundamental goal is to advocate for full inclusion, characterized by accessibility and participation on an equal basis. More information on the uniqueness of the CRPD can be found in my recent blog post here. I had the opportunity to participate in the COSP and would like to share some thoughts with you: First, on the principle of inclusion in the overarching discussion, and secondly on its role in the upcoming post-2015 development agenda. During the general debate, more than seventy representatives highlighted their countries’ efforts to align the CRPD with state law and policies. All statements can be found here. Striking for me was that during the overall debate, inclusion was debated more in the sense of integrating persons with disabilities in project planning and programs. But integration is not inclusion! Integration characterizes a process in which a group, considered as a minority or as being different, is moved back into the mainstream of society under the condition to fit into the existing environment. Inclusion, on the other hand, depicts a process that creates a barrier-free environment on the fundamental basis of equality and acceptance. Even though accessibility, defined as a barrier-free physical and social environment, was highly discussed by the present delegates, the prime focus was on infrastructure. However, the discussion did not highlight barriers imposed by disabling attitudes and the perception of persons with disabilities as “the others”. But why is impairment not perceived as a physical peculiarity like hair and eye colour? Why did and still does this lead to the construction of separated places like special schools, homes or workplaces? In this sense, a person is not disabled but becomes disabled and deliberately excluded. It is therefore astonishing that inclusion, the overarching goal of the CRPD, was discussed in a relatively narrow sense, basically not moving beyond a focus on infrastructural issues. Thus, the great potential to discuss deeply ingrained values and perceptions of normality and disability was not really exploited. This leads me to the second aspect on which I want to share some thoughts with you. When Chairman H.E. Mr. Macharia Kamau, Ambassador and Permanent Representative of the Kenyan Mission to the UN, gave his final statement, he depicted this conference as the building block for the upcoming High-Level Meeting (HLM) on Disability and Development on 23 September 2013. During the HLM, the cornerstones for the upcoming post-2015 development agenda will be laid: sustainability and inclusion. After Rio+20, it is unquestionable that the post-MDG development agenda needs to be sustainable. But, as General Assembly Resolution 63/150 states: “No internationally agreed development goals could be genuinely achieved without including the over 1 billion persons with disabilities in development”. Therefore, during this HLM the necessity will be stressed that future development goals should be aimed to create a sustainable, accessible and enabling environment that serves the functional needs of the whole community. The draft document is available here. And exactly this inclusive perspective is the great potential as it entails equitable development for all. Hence, with this approach, the two areas of development and human rights are linked in one process. One of the challenges in doing so is related to data. Development programs are built on profound data and measurable indicators, which are, for several reasons, essentially missing when it comes to the needs and challenges of persons with disabilities. Fundamentally, this starts with the question how disability can be measured in a census, especially considering the CRPD`s social model of disability as a mismatch between individual needs and the environment offered. So, the question can no longer be “Do you have a disability?” Instead, it has to be: “Do you have difficulties in seeing, hearing, concentrating? Because of a physical, mental or emotional health condition, do you have difficulty communicating, moving around, etc. ?” For further information see the work of the Washington Group on Disability Statistics. In sum, now it is time to not only take up the responsibility to write about inclusion, but to actually do something about it. And this can only be achieved when we tackle not only infrastructural issues but focus on social barriers imposed by attitudes. Therefore, at least we need to question what we perceive as normal and how we deal with difference. Farouq, a character in Teju Cole`s recent novel “Open City”, puts it this way: “Malcolm X recognized that difference contains its own value, and that the struggle must be to advance that value” (p. 104). To appreciate difference and remove barriers imposed on their basis are the cores of inclusion. And this puts responsibility on every single one us to make inclusion reality.